All I can say is, yum, yum! Mix the flour, sugar, cinnamon and butter with a fork in a small bowl. Keep aside. Butter and flour a 9X5 pan. Mix the flour, baking soda, salt and cinnamon powder in a medium bowl. Whisk well and keep aside. In the meantime in a mixer, add the sugar and butter. Beat till the mixture is creamy. Add the eggs, vanilla extract and apple cider. Beat well and slowly add the flour mixture. Mix well and fold the diced apple. Transfer the batter to the pan and top with the streusel mixture. Bake for 50 to 60 minutes till the cake is done. I love this weather- it’s perfect for such treats. 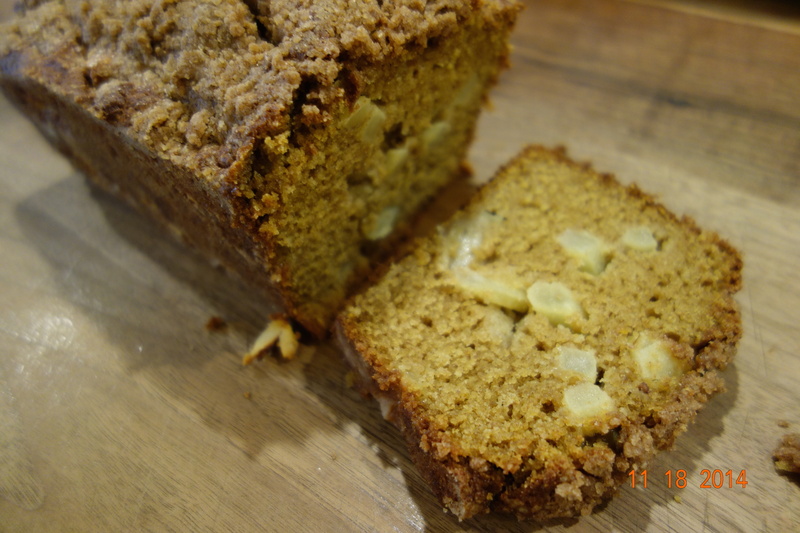 My daughter loves pumpkin muffins and bread and has been asking me to make something with pumpkin for a while. Now that I can see pumpkins everywhere- it was just a matter of time- well I had to make the time and bake something for my darling. It’s funny how they can make you feel guilty even without trying. So, I made the time and came up with this concoction. 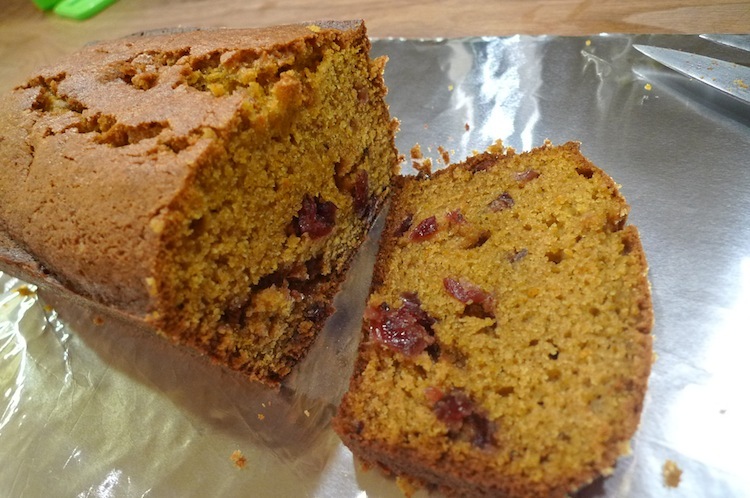 I didn’t want to make the regular pumpkin bread you get outside- I needed it to be a little different. I of course made it healthy by using the white whole wheat flour, turbinado sugar and extra light olive oil. I also added dark chocolate in there- it is good for you- in small quantities that is.. I also used walnuts instead of any other nuts since they are the most healthy to eat. There is healthy cinnamon in there too. All of that said, it is a very delicious bread- really it is. The pumpkin flavor goes very well with the dark chocolate and of course all the spices in there a match made in heaven. This is a different version of my delicious chocolate pumpkin bread. I decided to add orange zest and dried cranberries instead of chocolate to get a completely different flavor. It was a very successful try! Great for the fall and cold season. Sift the flour, baking soda, cinnamon, nutmeg and salt into a medium bowl, set aside. Lightly brush a 9X5X3 inches loaf pan with butter. Preheat the oven to 350 degrees F.
In a standing mixer fitted with a paddle attachment, cream the oil and sugar until light and fluffy. Gradually add one egg at a time mixing in between. Add 1 cup pumpkin puree and orange zest and mix for about 5 minutes. Remove the bowl from the mixer. With a rubber spatula, mix in the flour mixture until just incorporated. Fold in the cranberries and transfer the batter to the prepared pan. Bake for 55 minutes or until a toothpick inserted into the center of the bread comes out clean. Cool the bread in the pan for 5 minutes before taking it out. Cool completely before serving. I love, love this tea bread. We were invited to a friends house for a barbecue and I offered to bring dessert. I wanted to make a summer cake using a quintessential summer fruit and of course strawberries came to mind. I did a bit of research and came up with this fabulous recipe. I got all the ingredients together- which, by the way are all that you normally have on hand. It didn’t take me very long to put together and baking in the oven. Once it came out, my daughter was hovering around it like a dog on a bone. I cut a slice for her and she immediately complained about taking this cake to someone’s house and not having any for us. I promised her I would make another one for her soon- and honestly I haven’t yet. As I write this, I have already decided to bake one this evening. She will be thrilled. Preheat oven to 350 degrees F. Grease a loaf pan and keep aside. Beat the sugar and olive oil for 2-3 minutes on high. Add the eggs one at a time, beating in between. Add the pureed strawberries and keep aside. In the meantime, sift the flour, baking soda, baking powder, cinnamon, nutmeg and salt into a medium bowl. Add the dry ingredients into the wet mixture. Mix well and pour into the loaf pan. Bake for 55 minutes or till the bread is done. Invert onto a platter and top with confectioners sugar. Dessert number 3! 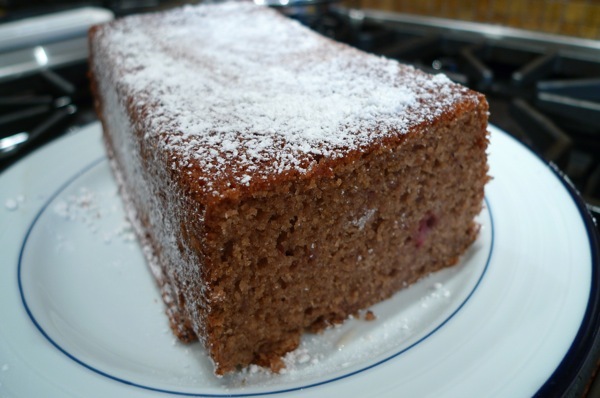 Use fresh or frozen cherries for this one… yummy! Preheat oven to 350 degree F. Lightly grease a 12 muffin tin with a bit of oil in each cup. In a small bowl, sift the flour, baking powder and salt. Pour into the egg mixture and stir well. Fold the cherries into the batter and mix to incorporate. 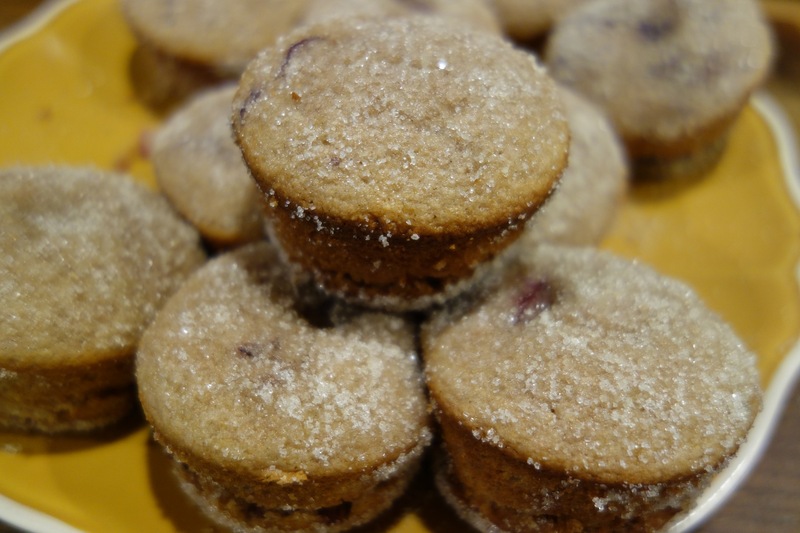 Divide batter evenly into the muffin cups, filling about ½ full. While duffins are baking, melt butter in a small bowl. Pour ½ cup sugar into a medium bowl. Once the duffins are done, lightly brush the top with melted butter, remove from the pan and roll in the sugar, coating all parts of the duffin. Add the chopped potatoes to a medium saucepan. Top with water and bring to a boil. Drain and let dry. Heat a cast iron pan with the olive oil. Add the potatoes and sauté on medium heat for 5 minutes. 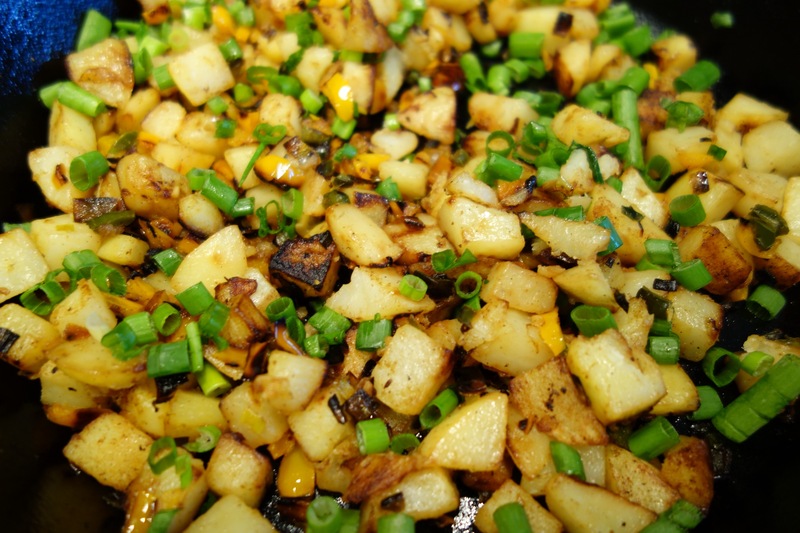 Add the whites of the green onions, garlic and yellow pepper and sauté for another 5 to 10 minutes. Add salt and the greens of the green onion. Check for seasonings and serve with brunch or breakfast. This is a great, quick snack to have- definitely one of my favorites.. 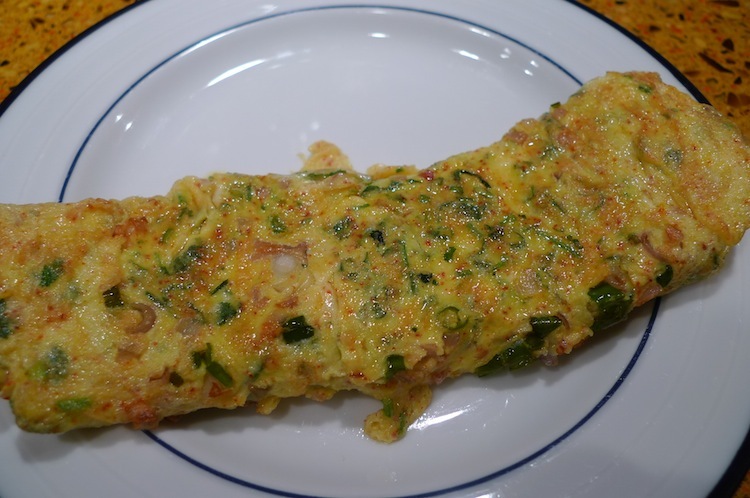 I usually make this delicious omelet when I don’t feel like eating anything else- or I am in the mood for something very spicy. I add lots of serrano chillies and cayenne pepper!